Fish is best cooked and served simply; fresh ingredients and simple preparation result in delicious results. One of my favorite dishes is Portuguese-style, grilled sardines which are a wonderful accompaniment to almost ANYTHING. Scale and gut the sardines (you can have your fishmonger do this if you are squeamish). Wash the sardines under cold, running water and pat dry with paper towels. Lightly rub the sardines with olive oil, salt them with coarse sea salt and refrigerate for a couple hours. 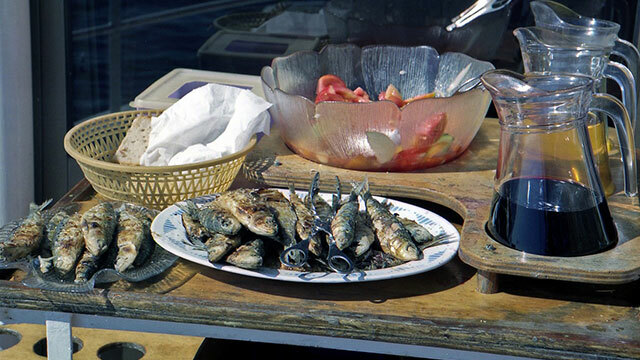 When grilling, place sardines on a hot grill watching them carefully (they cook quickly). Flip when the first side is done. Serve them with a side, drizzling any leftover olive oil as decoration.